Navbar Weather : Make your Navigation Bar useful! 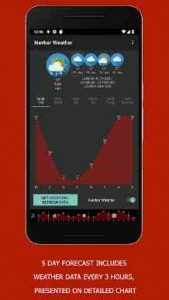 Change it to weather forecast with beautiful and detailed weather chart. It’s weather app that shows forecast in unique way – on navigation bar via eg. chart. So to use it you obviously have to have navigation bar in your smartphone or tablet. I’ve been using Huawei Mate 9 for over a year now. It always pissed me off that I had to put a widget on the home screen to check the weather forecast. But hey, why not use navigation bar for the weather forecast? So I decided to develop some small app for my Mate 9, that can show weather chart for next 5 days (in 3 hours intervals) on Navbar. It’s still in beta stage (please report me abut any bugs or new ideas in this thread before you rate it). It works pretty good for me, but for sure I know that there is a lot work to do. So far Navbar Weather was tested only on my Mate 9, but it should work also on any other smartphone with Navigation Bar. In case you did not liked the chart you can switch it to image forecast with data for next 12 hours and sunset and sunrise time. This app does NOT need ROOT access. Use it with any of your devices with Navigation Bar! If you experiencing that app is disappearing sometimes from navigation bar, try to turn off battery optimization for Navbar Weather in your Android settings. App need permission to get localization of your smartphone (to get localized weather forecast data) and permission to display over other apps (it’s obligatory to place weather forecast at your navigation bar). This works really well, and it’s actually useful. My one suggestion/complaint is that it’s pretty ugly. I think updating it with a more mater design (and possibly the ability to customize colors and appearance) would make this a perfect navbar app. Great app, does exactly what it says. Looks awkward with all black background though, so the ability to make it transparent would be amazing. Also, it would be nice to be able to change the priority of the notification.